The vacation villa was made to optimize outdoor living. Dine under the vine-covered pergola, on the dining terrace, or the living room terrace while looking out over Tamarindo Bay. A large grilling area with a sink is built with tile floors and countertops. A half level below is the infinity pool with underwater benches, surrounding tropical gardens, and a spacious lounging terrace made of Peruvian tile with a bougainvillea covered pergola. The inside of the house is tastefully designed but also built for comfort and convenience. All of the rooms have Peruvian tiled floors, artistically designed exotic wood doors, antiques, and luxurious furnishings. The indoor living room is made with vaulted ceilings and large windows. The adjacent dining room and kitchen come fully equipped with Brazilian marble countertops, stainless steel appliances, and a gas oven with six burners. An additional downstairs living room has a flat screen TV and opens to a large private terrace. 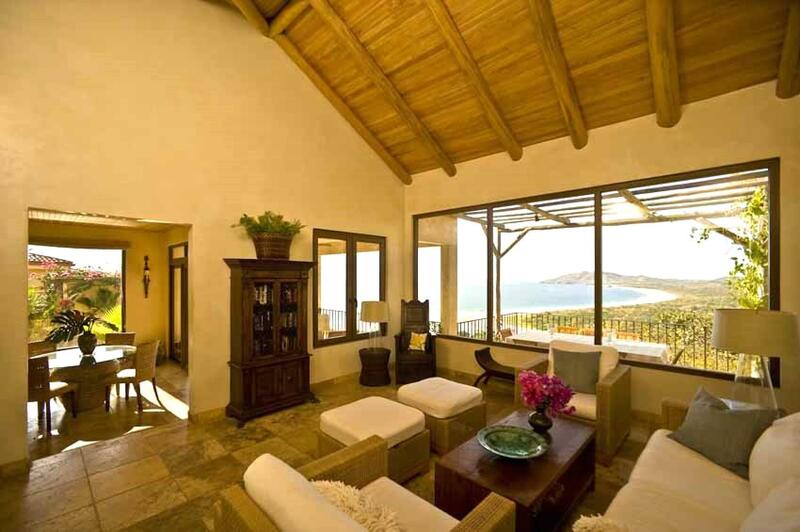 All of the bedrooms of Colina del Mar provide ocean views. The private master bedroom on the top floor includes a king size bed, flat screen TV, a Juliet balcony, and a master bathroom with exotic wood vanity, bowl sink, and a strata tiled shower that opens to an ocean view. A study that also serves as a bedroom is part of the master suite. The lower floor has two bedrooms, one with a queen size bed and chaise lounge and one with a double bed, and a large bathroom with a glass enclosed shower. A separate two story casita is next to the outdoor dining area and provides a queen size bed, a bathroom on each level, and a balcony on the top floor. Monkeys, birds, and whales can be spotted on the hilltop above Tamarindo and the shops, restaurants, nightlife, and beach scene are just a short jaunt from Colina del Mar. Andy and Cynthia, the caretakers living in the apartment above the garage, are available to make sure all of their guests’ needs are met.